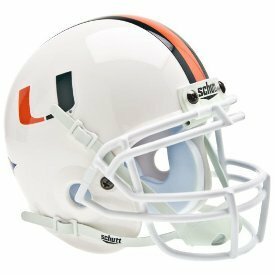 The Miami Hurricanes NCAA Mini Helmet is a half-scale replica, perfect for autographs and collectors. Along with an ABS plastic shell and plastic facemask, it includes a realistic foam padding, and 4-point vinyl leather chinstrap. 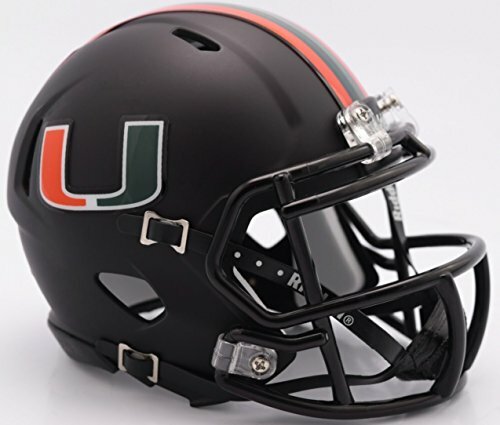 This helmet includes the official Miami Hurricanes NCAA decal made from the same quality material as game helmets. Size: 1/2 scale versions of High School football helmets. Size: 6", 4½"(W), 5"(H) - (NOT FOR WEARING). 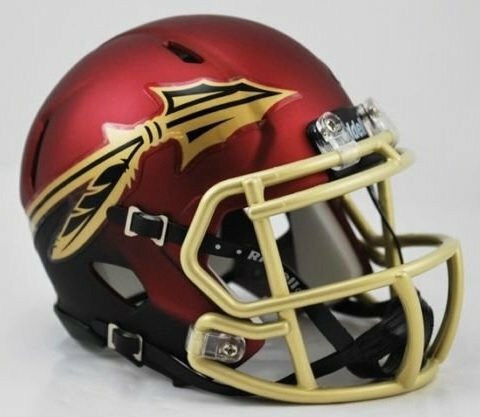 Florida State Seminoles Mini Speed College Football Helmet. The ultimate NCAA College mini speed football helmet collectible, perfect NCAA mini speed football helmets for autographs and collectors. Mini Speed Football Helmet with great graphics. Official NCAA Mini Speed Football Helmet with official NCAA team decal. ABS plastic Mini Speed Football Helmet shells with plastic facemask. Realistic interior foam padding, vinyl-leather chin strap. This is an affordable NCAA football helmet for the true fan. Size: 1/2 scale versions of NCAA football helmets. Size: 6"(L), 4½"(W), 5"(H) - (NOT FOR WEARING). 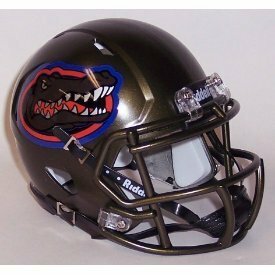 Florida Gators Mini Speed College Football Helmet. The ultimate NCAA College mini speed football helmet collectible, perfect NCAA mini speed football helmets for autographs and collectors. Mini Speed Football Helmet with great graphics. Official NCAA Mini Speed Football Helmet with official NCAA team decal. ABS plastic Mini Speed Football Helmet shells with plastic facemask. Realistic interior foam padding, vinyl-leather chin strap. This is an affordable NCAA football helmet for the true fan. Size: 1/2 scale versions of NCAA football helmets. Size: 6"(L), 4½"(W), 5"(H) - (NOT FOR WEARING). Miami Hurricanes Mini Speed College Football Helmet. The ultimate NCAA College mini speed football helmet collectible, perfect NCAA mini speed football helmets for autographs and collectors. Mini Speed Football Helmet with great graphics. Official NCAA Mini Speed Football Helmet with official NCAA team decal. ABS plastic Mini Speed Football Helmet shells with plastic facemask. Realistic interior foam padding, vinyl-leather chin strap. This is an affordable NCAA football helmet for the true fan. Size: 1/2 scale versions of NCAA football helmets. Size: 6"(L), 4½"(W), 5"(H) - (NOT FOR WEARING). 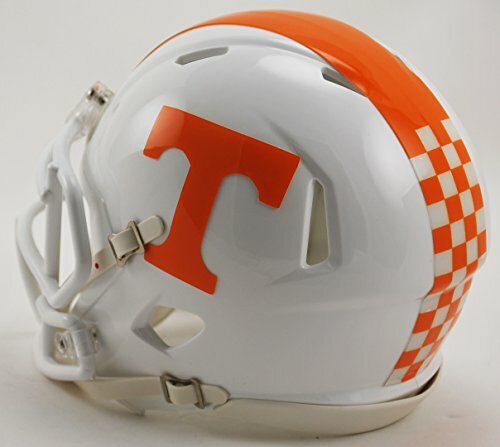 Tennessee Volunteers Mini Speed College Football Helmet. The ultimate NCAA College mini speed football helmet collectible, perfect NCAA mini speed football helmets for autographs and collectors. Mini Speed Football Helmet with great graphics. Official NCAA Mini Speed Football Helmet with official NCAA team decal. ABS plastic Mini Speed Football Helmet shells with plastic facemask. Realistic interior foam padding, vinyl-leather chin strap. This is an affordable NCAA football helmet for the true fan. Size: 1/2 scale versions of NCAA football helmets. Size: 6"(L), 4½"(W), 5"(H) - (NOT FOR WEARING). 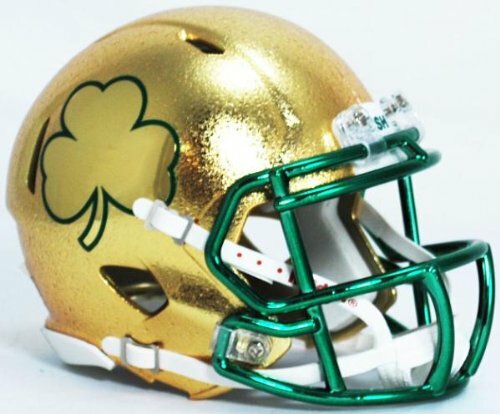 Notre Dame Fighting Irish Mini Speed College Football Helmet. The ultimate NCAA College mini speed football helmet collectible, perfect NCAA mini speed football helmets for autographs and collectors. Mini Speed Football Helmet with great graphics. Official NCAA Mini Speed Football Helmet with official NCAA team decal. ABS plastic Mini Speed Football Helmet shells with plastic facemask. Realistic interior foam padding, vinyl-leather chin strap. This is an affordable NCAA football helmet for the true fan. Size: 1/2 scale versions of NCAA football helmets. Size: 6"(L), 4½"(W), 5"(H) - (NOT FOR WEARING). 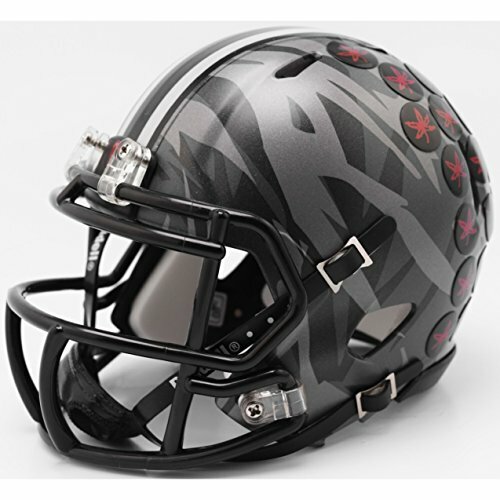 Ohio State Buckeyes Mini Speed College Football Helmet. The ultimate NCAA College mini speed football helmet collectible, perfect NCAA mini speed football helmets for autographs and collectors. Mini Speed Football Helmet with great graphics. Official NCAA Mini Speed Football Helmet with official NCAA team decal. ABS plastic Mini Speed Football Helmet shells with plastic facemask. Realistic interior foam padding, vinyl-leather chin strap. This is an affordable NCAA football helmet for the true fan. Size: 1/2 scale versions of NCAA football helmets. Size: 6"(L), 4½"(W), 5"(H) - (NOT FOR WEARING). 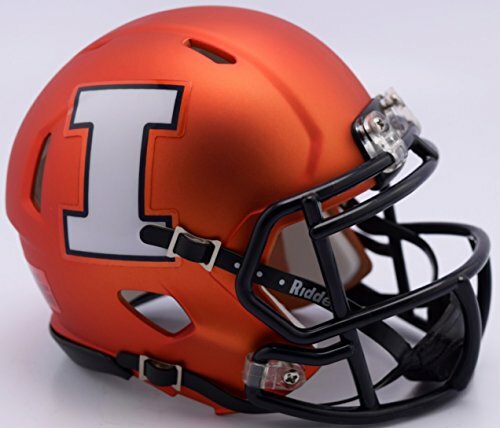 Illinois Fighting Illini Mini Speed College Football Helmet. The ultimate NCAA College mini speed football helmet collectible, perfect NCAA mini speed football helmets for autographs and collectors. Mini Speed Football Helmet with great graphics. Official NCAA Mini Speed Football Helmet with official NCAA team decal. ABS plastic Mini Speed Football Helmet shells with plastic facemask. Realistic interior foam padding, vinyl-leather chin strap. This is an affordable NCAA football helmet for the true fan. Size: 1/2 scale versions of NCAA football helmets. Size: 6"(L), 4½"(W), 5"(H) - (NOT FOR WEARING). Oklahoma Sooners Mini Speed College Football Helmet. 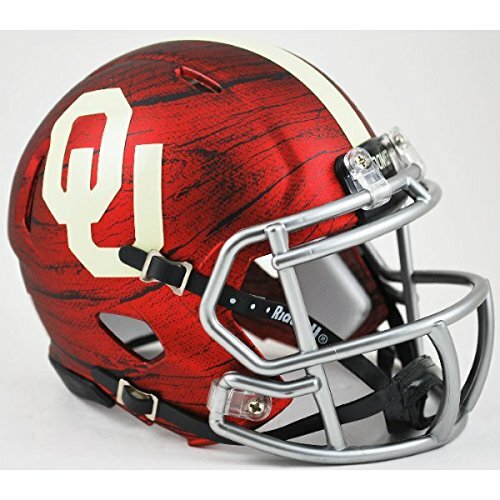 The helmet features a Hydrographic wood grain design shell, a gunmetal facemask, and cream OU side decals & top stripe. The ultimate NCAA College mini speed football helmet collectible, perfect NCAA mini speed football helmets for autographs and collectors. Mini Speed Football Helmet with great graphics. Official NCAA Mini Speed Football Helmet with official NCAA team decal. ABS plastic Mini Speed Football Helmet shells with plastic facemask. Realistic interior foam padding, vinyl-leather chin strap. This is an affordable NCAA football helmet for the true fan. Size: 1/2 scale versions of NCAA football helmets. Size: 6"(L), 4½"(W), 5"(H) - (NOT FOR WEARING). 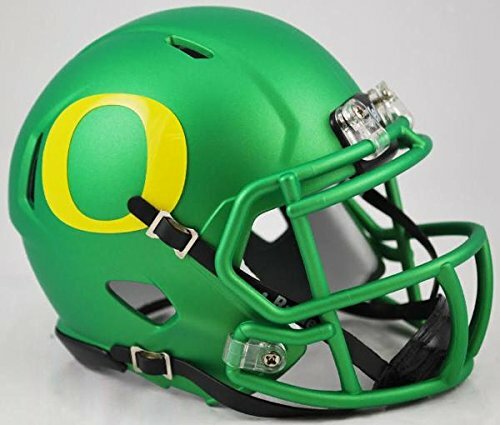 Oregon Ducks Mini Speed College Football Helmet. The ultimate NCAA College mini speed football helmet collectible, perfect NCAA mini speed football helmets for autographs and collectors. Mini Speed Football Helmet with great graphics. Official NCAA Mini Speed Football Helmet with official NCAA team decal. ABS plastic Mini Speed Football Helmet shells with plastic facemask. Realistic interior foam padding, vinyl-leather chin strap. This is an affordable NCAA football helmet for the true fan. Size: 1/2 scale versions of NCAA football helmets. Size: 6"(L), 4½"(W), 5"(H) - (NOT FOR WEARING). Copyright © Wholesalion.com 2019 - The Best Prices On Ncaa Mini Helmet Vinyl Decals Online.